Julie’s love of baking began in the kitchen with her mother and grandmother. It was living in Portugal, however, that sparked her innate creative talent for luxury cake design. 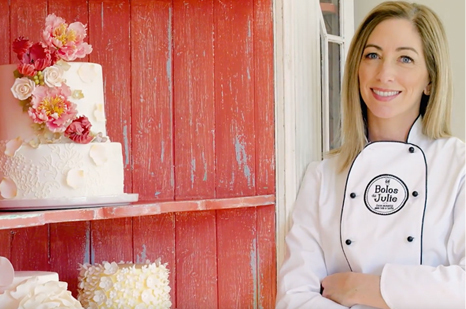 Julie’s career evolved as she transitioned from editorial design work to elaborate cake artistry. She studied with various renowned cake designers and travelled between Portugal and the U.S. to train at the famous Wilton School of Cake Decorating and Confectionery Art. Julie also developed popular decorating workshops, novel “pop-up” cake shops and by 2010, had become the luxury cake artist in Portugal known for her beautiful and delicious creations. For almost 20 years, Julie and Jacques Deffense (the other passionate love of her life!) have resided just outside of Lisbon in beautiful coastal Cascais – currently the number one wedding destination in Europe. Portugal opened many doors for Julie. Her talent for high-end cake artistry attracts a loyal following and she is continually featured in many top European magazines, on wedding and lifestyle blogs, and as a baking and cake design expert on Portuguese television. With impressive mastery of the Portuguese language, Julie is a successful book author in Portugal. She has written three popular cookbooks and is currently working on her fourth.